Beatrice Concrete Company was founded in 1944 and developed by Everett R. Jones and J.W. Lawler who remained partners until 1983. In 1983 the current owners incorporated Beatrice Concrete Company. 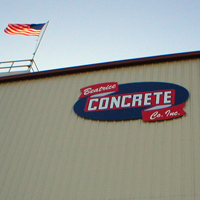 Beatrice Concrete Company, Inc currently operates throughout southeastern Nebraska with ready mix plant facilities in Beatrice, Crete, Fairbury, Tecumseh, and Highway 2. Beatrice Concrete Company is a producer of sand & gravel, and crushed rock at various mining locations. Beatrice Concrete Company, Inc has over a 60-year record of service to the surrounding communities and currently employs 75 employees. Beatrice Concrete Company, Inc is dedicated to the development of Beatrice and the surrounding area by producing high quality products and providing timely, reliable, and courteous service.